All around the world, diadromous fish are facing multiple anthropogenic pressures resulting in a global decline in these migratory species. In Gironde, the allis shad populations which were the most abundant in Europe are no exception and have dramatically declined since 2000. Failure in reproduction success is one of the proposed explanations for this collapse. In light of this, we studied the reproductive strategy of the allis shad populations in the Gironde watershed. We used an original methodology to define the thermal behavior of allis shad during reproduction using an electivity index for 14 years of field monitoring in two rivers, composed of daily reproduction activity and temperature. For the first time, this study deeply explores and defines the thermal preference of a shad species during the reproduction. A temperature preference between 14.5 °C and 23 °C by spawners during the reproduction was observed. Despite annual fluctuations, an overall similarity of temperature ranges between the two rivers was observed. The thermal preference matched with the thermal tolerance of early stages (16.2 °C to 24.8 °C) and confirms that allis shad spawners adopt behavioral rules of reproduction in order to maximize the survival of their offspring. 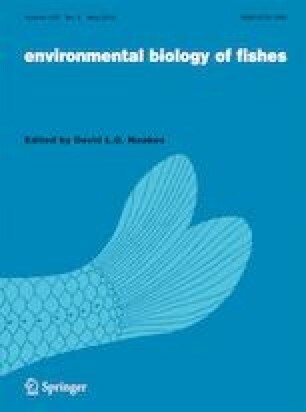 The similarity of shad thermal behavior may indicate the phylogenetic basis of thermal preference for fish species. The online version of this article ( https://doi.org/10.1007/s10641-019-00874-7) contains supplementary material, which is available to authorized users. This work was supported by the Regional Council of Nouvelle Aquitaine (FAUNA project) and the Water Agency of Adour-Garonne (SHAD’EAU project). Paumier A. analysed the data and wrote the paper, Drouineau H. analysed the data and wrote the paper, Carry L. performed the field work, Nachón D.J wrote the paper and Patrick L. analysed the data and wrote the paper.